Additional Camera for PeakTech 5600 - 200 cm Flexible "Goose-Neck" Dust and waterproof additional camera for our PeakTech 5600 with 6 dimmable LEDs for illumination of any object. The diameter of the flexible camera is only 8.2 mm and small enough to enter even the smallest openings. Suitable for all applications, the wide viewing angle of 60 °, as well as the automatic focus from 30 mm to infinite ensure a clear view of the object. 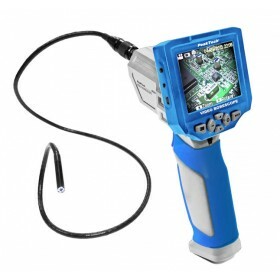 Video Borescope In hobby and professional use, some objects such as terminal ports, electronic components, breaks, constrictions, cracks or other components often must be located and examined in "hard to reach“ locations. 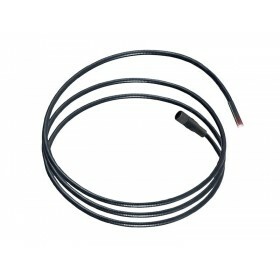 This new video borescope-camera offers a number of excellent technical properties, such as the detachable display connected by video cable or the high resolution camera with 6 dimmable LEDs for illumination, which can store photos and videos on a micro SD card. In addition, the diameter of the flexible camera is with only 8,2 mm small enough to get through the smallest vents and gaps. Suitable for all applications, the wide camera viewing angle of 60°, as well as the automatic focus from 30 mm to infinity ensures a clear view of the subject. 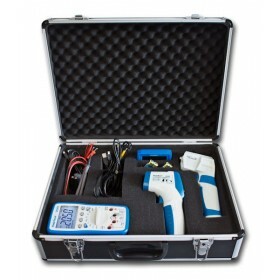 PeakTech 8102 - Measurement Equipment Set "Service"
Measurement Equipment Set "Service" For daily use in the service area designed, this case system contains everything needed for installation and maintenance of all electrical installations and other systems in the industrial and crafts area. The PeakTech 2025 Digital Multimeter is suited for a high variety of measurements of electronics, such as AC and DC voltage, current, capacity, resistances, frequencies and temperatures. The device also has a USB port for data recording of all measured values to the PC. The PeakTech 4945 IR-Thermometer enables rapid, simple and accurate measurement of surface temperatures, with laser pointer for noncontact, fast temperature measurement of hot or moving objects or difficult measuring points from a safe distance.